Microsoft's motion-sensing Kinect technology will be available for Windows PCs in a few weeks and is destined for a lot more than just gaming, CEO Steve Ballmer said at the Consumer Electronic Show in Las Vegas Monday. It was Microsoft's last keynote at CES, and Ballmer was joined on stage by actor Ryan Seacrest who helped host the event. But there was no surprise appearance from Bill Gates, as some had expected, and not much in the way of big news -- perhaps a reminder of why Microsoft has decided to give up the CES stage. Ballmer announced that Nokia's Lumia 800 Windows Phone will go on sale at Microsoft's retail stores in the US "in the next few months". The phone will be sold unlocked, he said, meaning Microsoft hasn't signed a contract with a wireless carrier to offer it. He also announced a partnership with Fox that will bring "Glee", "Family Guy", and "Bones" to the Xbox, and with Comcast for its Xfinity TV service. The new programs will come to the Xbox this year, he said. Aside from that, there were lengthy demonstrations of Microsoft's upcoming Windows 8 OS and the new Metro interface, and of its Windows Phone software, but there was little new information about those products. 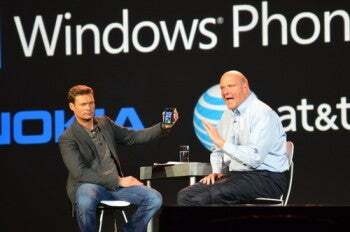 Microsoft announced its biggest news at the show earlier in the day, when Ballmer appeared on stage at an AT&T event to announce Nokia's first Windows Phone, the Lumia 900. A Windows manager showed a version of the game "Cut the Rope" that has been developed in HTML 5 for Internet Explorer 9. And she showed a password feature for Windows 8 that will let people unlock their PC by clicking on parts of a photo in the right order, instead of typing a password. A beta of Windows 8 will be available for testing in late February, she said, and the Windows 8 store will open with a selection of free apps at that time too, she said. Eventually, businesses will be able to distribute corporate apps to employees through the store as well, she said. Seacrest kept the 90-minute show moving along and earned his money with kind words about Microsoft's products. "From Xbox to phones to Windows PCs, I've always been impressed by their products," he said at one point. There was surprisingly little reminiscing about Microsoft's keynotes, apart from a video at the beginning that showed some of Ballmer's and Gates' more memorable moments. Microsoft has given 15 of the last 18 keynotes at CES, starting with Gates in 1995 -- the year Yahoo was incorporated and just before the web went mainstream. Last month it said it would no longer have a big presence at CES, because the show doesn't fit with the timing of its big product releases. Microsoft Kinect has been offered so far only for the Xbox, allowing people to control what happens on screen by moving their arms and legs. Microsoft has shipped 18 million Kinect sensors since the technology started shipping about a year ago, Ballmer told the CES crowd, gathered at the Venetian Resort Hotel Casino. Microsoft is also working with 200 companies to develop Kinect applications for PCs, he said, which will let people use physical gestures to do other things besides gaming. It remains to be seen exactly what, though a Microsoft video suggests things like playing musical instruments, controlling robots and doing exercises. In fact, the Kinect sensor for Windows is available for preorder now from Amazon's online store, priced at US$250. The item will be released Feb. 1, the site says. "Just as Kinect revolutionized gaming, we'll see it revolutionize other industries, like entertainment, healthcare and more," Ballmer said. Microsoft is also using Kinect to bring interactive TV to the Xbox. As an example, it has signed a deal with Sesame Street, which will develop programs that let children interact with puppets. A young girl took the stage to show how she could mime throwing objects at the screen, and count along with the characters as the items landed in a box. Gary Shapiro, head of the Consumer Electronics Association, predicted Microsoft will return to CES. "I would be shocked if a Microsoft leader does not return to the stage again in the next few years," he said in introducing Ballmer. But for next year, the CEA will have to find someone else.